BUTTERMILK AND OAT CHICKEN SCHNITZEL from Anja Dunk’s Strudel, Noodles and Dumplings. meld and the chicken become tender in the buttermilk . 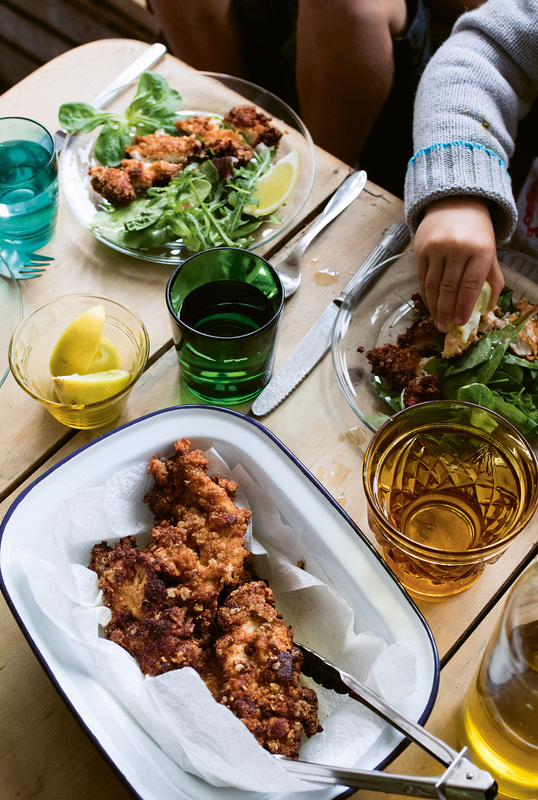 The good news here is that these are not a messy affair of flour dipping, followed by egg dipping, then breadcrumb coating – you simply dunk the buttermilk-covered chicken into the dry ingredients until the chicken is evenly coated, then fry for a matter of minutes. Marinating time aside, this is fast food at its best. garlic, sweet paprika, marjoram, buttermilk and mustard together in a jug, then pour this mixture over the chicken. Mix everything together with your hands (or turn over with a fork) until evenly coated, then cover with clingfilm and leave to marinate in the fridge for a couple of hours (up to 24). Take the chicken out of the fridge half an hour before you want to eat, to allow it to acclimatise. Mix the oats, almonds, baking powder, flour and salt together in a shallow dish. time, it is always good to check that the chicken is cooked all the way through. Drain on kitchen paper and serve alongside a green salad.